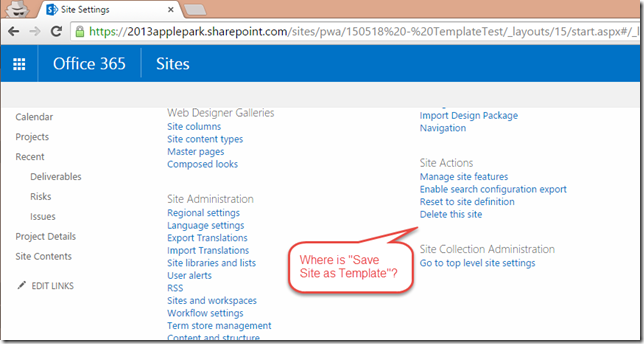 04 Jun Save Site as Template – No longer an option! Modifying an existing project site, saving it as a template and then associating that template to an EPT is something that I’ve been doing for many years in one form or another with Project Server systems (prior to 2010 there wasn’t an EPT construct, but the ideas were the same). When it comes to Project Online, the process is the same, but I’ve hit an issue on at least two Project Online tenants where I have not been able to save a site as a template because the menu option no longer exists. There have been various blogs around this issue, primarily posted here and here, but neither of them matched my particular scenario, as my SharePoint Server Publishing Infrastructure was already de-activated! So, what should you do, if Publishing is deactivated but you still cannot save a site as at template? 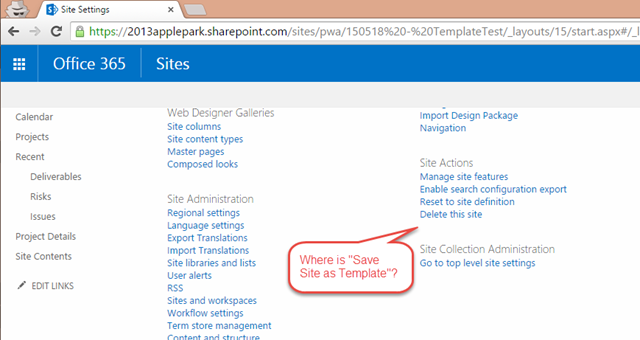 Simply append /_layouts/savetmpl.aspx to the site and you’ll be able to save the template.